Welcome to our dog grooming salon. Member of National Dog Groomers Association of NZ since 2010. 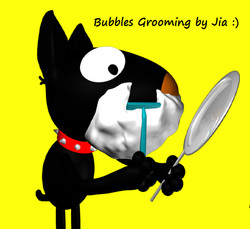 We have developed dedicated grooming services for your pooch. Based on different coat, hair condition, personality, weather and preferred haircut styles, each dog has a unique record to guarantee the most personalized grooming experiences. Deodoring with Bio-Groom Natural Scents cologne. Our grooming services are customized to meet demands ranging from tidy shave off to classic pure breed hairstyles; from common teddy bear trim and puppy cut to modern Japanese grooming or Asian styling. You can even bring photos of a unique style and we will make that happen to your fluffy! For difficult tangles and dematting procedure, we use high quality US imported coat breaker and slicker brush to minimize discomfort and hair damage to provide a smooth finish.